I previously made a blog post on clothing pieces from movies/tv series I wanted to replicate as part of my New Year’s resolutions. I expanded on that this weekend by completing a dress and knitted hat. 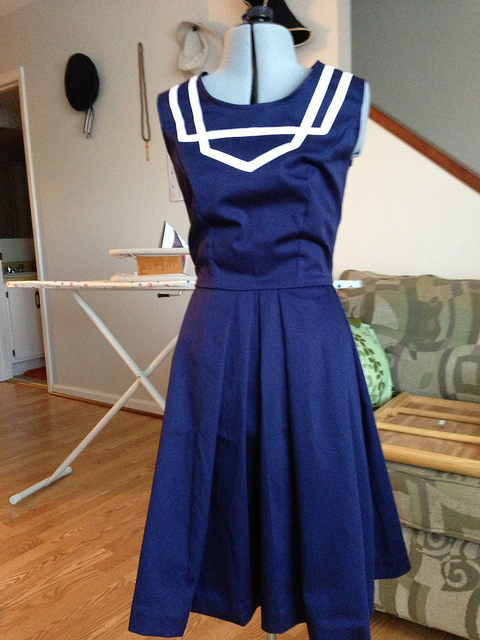 The dress is based off of the What a Ketch dress on Modcloth that is by designer Dear Creatures. I first saw Peneloping make her own replica of the dress. At first all I thought was “How cool is that?” but recently I had been thinking “Why can’t I make that?” I used the same Simplicity pattern as Peneloping did, but I had to make some modifications. 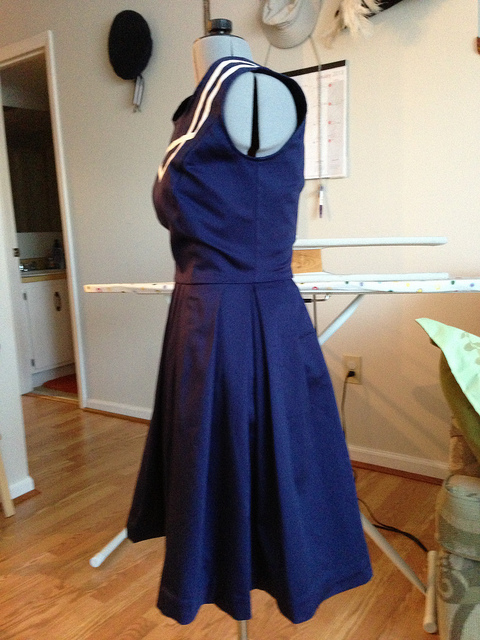 I used a cotton stretch sateen since I could not find a navy knit in the right color or weight (the sateen was just lying around from some project I can’t remember; I literally stumbled across it while rifling through my fabric storage). The sateen gives it a more formal feel making it work appropriate (once the weather cooperates). The front darts were not aligning with my body, so I redid the top with princess seams that fit better on me and match the original dress. 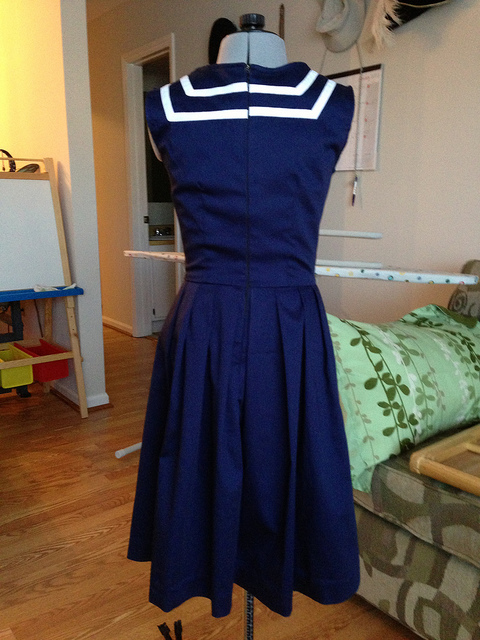 I also lowered the neckline to just about my collarbones, and lowered the hem to just below my knees. The armholes were widened a bit which makes them a little wonky, but I plan to always wear this dress with a cardigan or shrug (I’m really not one for completely baring my shoulders to the world). The design doesn’t line up exactly in the back despite my best efforts. It’s also a little more narrower in the left shoulder than the right. You’ll also have to excuse my dressform; it’s shorter in the torso than I am. The dress fits very well on but it hasn’t been washed so I’m not modeling it. But, overall, I love my new dress, but I think it looks far better on Peneloping than it does on me. The second project I completed this weekend was a knitted Doctor Who inspired slouch featuring the Tardis. Pattern is on Ravelry by Shawna Synder. My cat Kulin is my model this time. It took me 8-9 hours to complete while watching the Presidential inauguration, followed by a Law & Order marathon and the evening news. I love this new hat and can’t wait to wear it. My mom also likes it and would like one knitted for her even though she is not a Doctor Who fan (she finds the series rather odd). I am also planning on knitting one as a belated birthday gift to one of my oldest and best friends, Shannon, who is a huge Doctor Who/British tv fan. My next non-replica sewing project is a skirt. I have tons of eggplant and sky blue sateen that I plan to turn into two skirts. Once those are complete (or nearly so), I am going to attempt to finish my Hermione sweaters and get started on sewing her red dress. 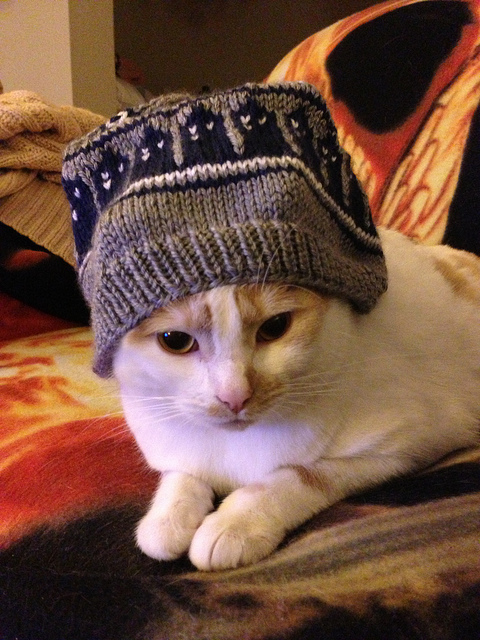 This entry was posted in Doctor Who, Uncategorized and tagged beanie, doctor who, dress, dressmaking, hat, knit, knitting, sewing, slouch, tardis. Bookmark the permalink.